This link from my friend Sam. An Israeli newspaper has published a report of what it claims is an Israeli-Palestinian document which foresees the establishment of a Palestinian following an Israeli withdrawal from territories captured during the Six Day War. The report appeared in the Yedioth Aharonoth newspaper a few weeks ago, and details plans for a gradual Israeli withdrawal from Judea and Samaria and the presence of a multinational force stationed in Palestinian areas and on the Temple Mount. According to the paper, the plan was been drawn up by the Israeli and Palestinian negotiating teams, and has been presented to US Secretary of State Hillary Clinton and US Middle East Special Envoy General Jim Jones. The plan will entail Israel withdrawing from Judea and Samaria within a 30 month timescale. A multinational force would be deployed in the Palestinian areas, which would become strictly out-of-bounds for Israelis. The Old City of Jerusalem would be shared by both Israel and the new Palestinian state, but a multi-national force would enforce law and order in the capital. A separate multinational force would maintain control on the Temple Mount. Quote: "The document published in Yedioth Aharonoth Friday reveals for the first time plans for a gradual Israeli withdrawal from the West Bank in a 30-month period, travel restrictions for Israelis and Palestinians, security arrangements and details of the final borders. Three West Bank highways will be designated for sole Israeli use. Motorists will not have to carry passports but will be provided with a GPS tracking system and panic button for the trip, the paper said. A motorist who strays from the designated route and enters a Palestinian controlled area, will be arrested by members of a multinational force, and returned to Israel to stand trial, the paper said. The document was completed in recent months by a joint Israeli-Palestinian team, and made available this week to U.S. Secretary of State Hillary Clinton and U.S. Middle East envoy Gen. Jim Jones, the paper said. This news follows recent speculation that the US Administration was about to present its own peace plan to Israel and the Palestinian Authority within the coming weeks. According to reports, rather than concentrating on confidence building measures such as ending terrorism and halting the settlements, the plan will focus on security arrangements and delineating the borders of a future Palestinian state. This news also follows recent statements by EU High Representative for the Common, Foreign and Security Policy Javier Solana, in which he said that if Israel and the Palestinian Authority could not reach an agreement within a set timeframe, that one should be imposed on them by the international community. As my friend Sam states, an Israeli withdrawal from Judea, Samaria and east Jerusalem over a 30 month period ought to ring a bell with every Bible-believing Christian. The Bible indicates that the Antichrist, a world statesman hailing from the revived Roman Empire (Daniel 9:27), will strengthen an agreement between Israel and many nations. The Bible does not go into the explicit details of this covenant, but we can make an educated guess at what it entails according to the events that are to take place during this seven year period. Daniel's prophecy states that at the beginning of this time period, the Jewish sacrificial system will have been restarted, and Revelation 11:2 indicates that a Jewish Temple will have been built on the Temple Mount. Halfway through this seven year period, the Antichrist will enter the Temple and declares himself to be God (2nd Thessalonians 2:4). It is at this point that the Antichrist breaks his agreement with Israel, puts a stop to the sacrifices, and divides the land of Israel for his own gain (Daniel 11:39). Zechariah 14:2 and Revelation 11:2 declare that half of Jerusalem will go into captivity, and that the holy city - which is probably the Old City area of east Jerusalem, will be occupied by the Gentiles for 42 months. This period, which Jeremiah calls the "time of Jacob's trouble", will be the worst period of persecution the Jewish people will ever experience (Jeremiah 30:7). Zechariah 12 says that Israel's enemies will be in siege both against Judah and Jerusalem, and as we saw lately, this is the area of Israel that stretches from Gaza to the southern half of what is termed the 'West Bank'. The Lord Jesus Christ prophesied that Jews living in this region would literally have to drop everything and run for their lives (Matthew 24:15-22). This week, Palestinian leader Mahmoud Abbas was re-elected President of the Palestinian Authority, at the sixth Fatah General Assembly. This man, whom the mainstream media declares a moderate, has openly stated that Palestinians will "continue to be sacrificed [in 'martyrdom' operations] until residents of Jerusalem are free of settlements and settlers". This man, who openly calls for the murder of Jews until Israel withdraws from all of Jerusalem, is the man the international community is demanding that Israel do business with. As you can see, the day is not far off when Israel will be forced out of east Jerusalem and the time of Jacob's trouble will begin. Praise God that it will only be for a 42 month period, and that God in His mercy will intervene before mankind brings an end to himself. But events are taking place today just as the Bible predicted they would. God has provided us with information about our future in the Bible so that men would realize that He is the Lord and would turn to Him for salvation. 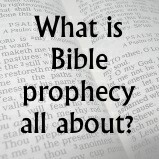 The Bible says the "testimony of Jesus is the spirit of prophecy", Revelation 19:10. He is the whole reason for prophecy, and all prophecy points to Him. Do you have any hope for the future? Have you trusted Jesus Christ as your personal Saviour? Will you be caught up to be with Him in the air when He comes for His Church? Or will you find yourself caught out with a world that is totally unprepared for what is about to take place? Don't leave it too late. Turn away from your sins, and trust in the Lord Jesus Christ for salvation today.